Friday, April 1, 2016 is free admission day at the Santa Cruz Museum of Natural History; no fooling. Exhibits include a touch pool with live local intertidal plants and animals. Also, the Native Peoples of Santa Cruz exhibit explores life in Santa Cruz prior to the arrival of Europeans. Examples of native basketry, beadwork and stone implements can be found throughout the exhibit. The Museum celebrated its 110th anniversary, opening August 21, 1905. This entry was posted in Free, Museum on March 27, 2016 by bayareastories. The Oakland Museum of California presents digitized images from A Butterfly for Oakland, Judy Chicago’s 1974 site-specific installation on the shore of Lake Merritt. 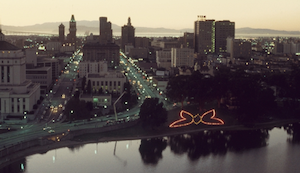 A Butterfly for Oakland was created using a combination of commercial fireworks and road flares. The displays were then lit by hand, resulting in a “painting” of colored smoke. OMCA commissioned Chicago to make A Butterfly for Oakland for the exhibition Public Sculpture, Urban Environment. Several of the large sculptures on and around the Museum campus were part of this exhibition, including the redwood burl sculpture The Planet by J.B. Blunk located outside of the entrance to the Gallery of California Natural Sciences and Bruce Beasley’s cast Lucite Tragamon in the Museum’s Koi Pond. This entry was posted in Exhibit, Museum on April 27, 2014 by GaryWiens. 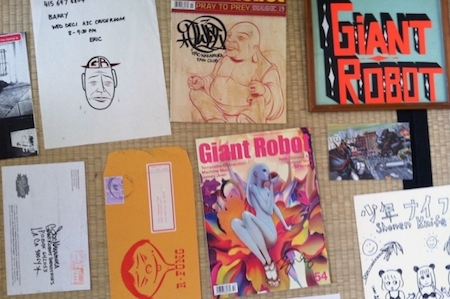 SuperAwesome: Art and Giant Robot featuring works by 15 contemporary artists who have been a part of the magazine’s social and cultural evolution. A range of mediums, including mural art, sculpture, illustration, portraiture, large-scale installations, graphic novels, photography, and more. This entry was posted in Exhibit, Museum on April 26, 2014 by GaryWiens. 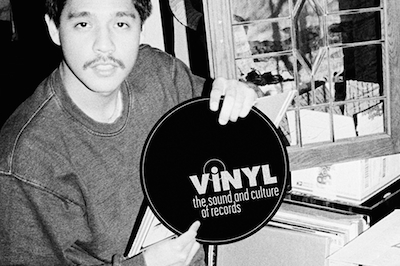 Vinyl: The Sound and Culture of Records explore the social and cultural phenomenon of listening to, collecting, and sharing records in vinyl. This entry was posted in Exhibit, Museum on April 25, 2014 by GaryWiens.